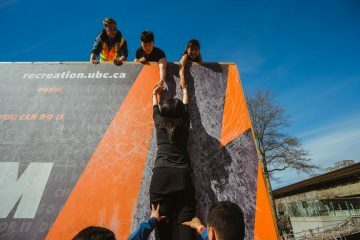 UBC Recreation hosts iconic events nearly every week throughout the school year at varying levels of competition. Whether you register as a team with your friends, or you want to sign up as an individual to meet people with similar interests, there’s always something fun to do to get moving. Teams are welcome to register for the Sports Day Waitlist until Thursday April 25 at 9:00 AM and will be notified by Friday April 26 if a spot has become available for them to participate. 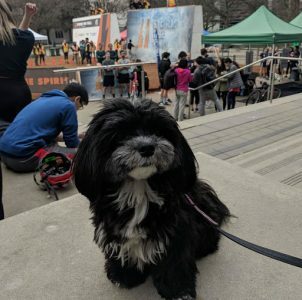 If your team is no longer able to participate in Sports Day, please email sports.day@ubc.ca by Thursday April 25 at 9:00 AM so another team can be given the opportunity to enjoy Sports Day! If one of your teammate’s are no longer able to participate in Sports Day, or a co-worker would like to now participate, Captains have until Friday April 26 at 5:00 PM to add or remove people from the roster. IMPORTANT: Teams are unable to pick up their event day registration packages until all members have signed a waiver. Captains are responsible for ensuring that all members have completed their waivers. Gain some extra time on Sports Day and pick up your race day package during Pre-Race Package Pick Up on May 1 instead of heading to race-day registration on May 3. The list of teams that qualify for Pre-Race Package Pick Up will be sent to Captains on Monday April 29 in an excel spreadsheet. Search for your team and captain to see if you qualify. Pre-Race Package Pick Up will be on Wednesday May 1 in the ARC Main Level Studio (Life Building) from 12:00 – 1:00 PM and 4:00 – 5:00 PM. Only one representative needs to come to Pre-Race Package Pick Up, and must have the Team Name and Captain’s Name to collect the race package. The representative does not need to be the captain. Get involved with Sports Day as an event Volunteer! Volunteers will be responsible for running activity stations and helping ensure the success of the event. Volunteers are required to attend a mandatory training session on May 1 and be available on May 3. 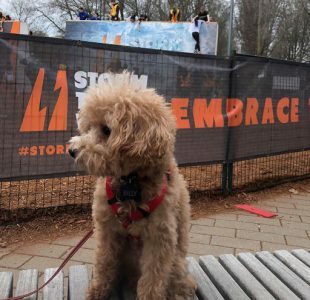 The first day of Storm the Wall has come to an end! Community teams led the way and kicked off the event with true panache. But after a long day of running, biking, swimming, and climbing, sometimes we need some cuddles from our best friend. The furry, smiley, tail-wagging kind. 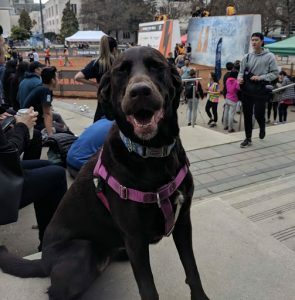 So scroll down and see Storm’s Furry Friends giving participants all the love and support anyone could ask for. Finley (@finleythetoller) and Leo the Golden! These good boys were spotted giving their biggest smiles for their team Sub it up The Wall! They are considered the 6th and 7th members of the team – and we can see why! These guys know the best spots for spectating all the action happening on the wall, specifically, right outside of the AMS Nest. Next up… Kula and Rosie! These fluffy buddies were perfect for a post-race hug! However, these pups were dedicated to giving their team, Colton’s best friends, all of their love, encouragement, and attention. 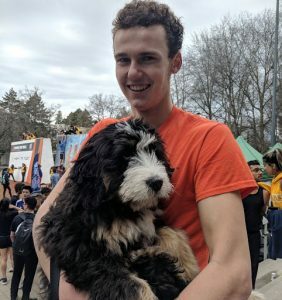 This love-ball is what you’d call a berniedoodle (in case you need to google lots of puppy photos later). Her favorite thing to do is come to Storm and cheer on her best bud Hugh and his team Boat Movers! Last but not least, Molly and friend! Meet the free-lance agents of Storm the Wall 2019! These doggos didn’t have a specific team to cheer for but they wanted to watch all the action nonetheless. As you can see, Molly had a particularly fun time watching the teams get over the wall. There is a larger, and more important lesson we can take from our furry friends, and that is the importance of giving support! This week, teams and iron persons will be doing their best to achieve their personal goals and make the most out of this amazing event. 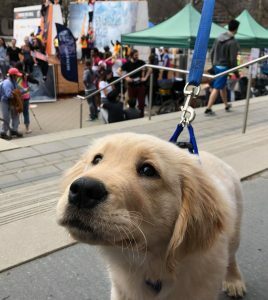 As UBC students and community members, let’s also do our best to cheer them on! So swing on by the Nest building between 10:20-4:30pm tomorrow and show some spirit. Check out the Facebook Event Page or our website for all the information you’ll need to Storm the Wall as a team, participant or spectator! Aaaah, it’s finally that time of year again. The sun is shining, the birds are chirping, and… is that a 12-foot wall set up in front of the Nest? That can only mean one thing: it’s time to celebrate the end of another year by gathering some friends (or tackling it solo!) and Storming that WALL. Choose a Storm Clinic time that works for you, and ideally 3 of your teammates – this is a crucial step! Keep reading to find out why! 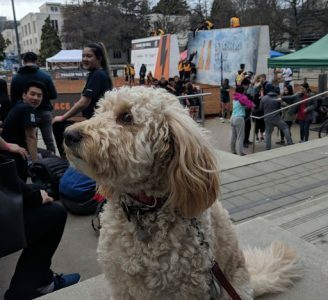 Get pumped to participate in one of UBC’s most beloved events. This is one for the bucket list, whether this is your first Storm or your fifth. So, what’s up with this whole Clinic thing? Well, this is a time for you to learn how to maximize your time at Storm by learning how to do it SAFELY and FUN-LY (not a word, but you know what I mean), as well as ask any questions you may have. If you and your pals are racing together, you must send at least ONE person to attend the clinic. You will need to find a date and time that works for as many of you as possible, and select this time slot as you register. This person can be in charge of passing the important info along to the rest of the team, but if possible, we recommend going as a full team. WHY? Well, if you have at least three of your members with you, you can practice scaling that wall! Nothin’ like a quick Spiderman sesh between classes. You have to attend a clinic in order to race, and because it’ll be either just you – or you plus your wallperson – you can practice on the wall once the teams are finished. You can go to any clinic you want, there’s no need to register for a specific one. Just make sure you DO attend a clinic, because it’s mandatory in order to be eligible to race! We know you’re ultra amazing already, but it’s always good to practice. Your clinic details (like the location and time) can be found during your registration, and all you need is your STUDENT ID and some wall-climbing clothes! Take it from me, you tend to get a little mulch-y when you’re practicing, so leave those new cream pants at home and opt for something you don’t mind getting a bit dirty. 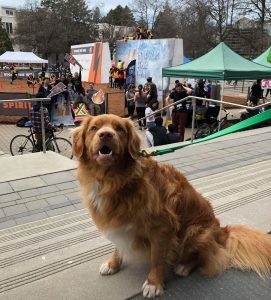 Let’s storm some walls, UBC. Can’t wait to see you at clinics! For more information, check out the Facebook event page – and don’t forget to register by March 15th!